BAMAKO, Feb 10 2012 (IPS) - Mali’s political parties have jointly called on the government to hold a forum for peace and reconciliation as a way to end a Tuareg rebellion launched several weeks ago. The uprising has forced around 55,000 people out of their homes, the majority fleeing the fighting in the north of the country, but others are seeking shelter from ethnic tension and violent demonstrations in cities in the south. The uprising by the National Movement for the Liberation of Azawad (MNLA) has claimed dozens of casualties since mid-January, including members of the army and the rebels, though precise numbers have not been established by independent sources. In a Feb. 7 statement, the United Nations High Commission for Refugees said it has sent emergency teams to countries bordering Mali to help meet the needs of around 20,000 refugees in neighbouring countries. “In the past three weeks, at least 10,000 people are reported to have crossed to Niger, 9,000 have found refuge in Mauritania and 3,000 in Burkina Faso,” UNHCR spokesman Adrian Edwards said in Geneva on Tuesday. “Many of the new arrivals are sleeping in the open and have little access to shelter, clean water, health services and food,” Edwards said. The Red Cross estimates that 30,000 others have been displaced within Mali since the first MNLA attack, against the town of Menaka, took place on Jan. 17, against the town of Menaka. The rebels have gone on to attack several other army garrisons in the north of the country. Since then, popular anger over the attacks has grown in the south. Violent demonstrations took place in several southern cities including Kayes, Ségou, and the capital, Bamako, between Jan. 31 and Feb. 2. The marches were organised in reaction to what protesters view as a “timid” reaction by the authorities against the rebellion, but in many cases degenerated into rioting. Modibo Diaby, a resident of the southern town of Kati, told IPS that he saw numerous businesses belong to Tuaregs – or people believed to be Tuareg – were looted; similar scenes occurred elsewhere in the south. The Malian president, Amadou Toumani Touré, has called on Malians not to confuse the insurgents with Tuareg civilians more generally. “Those who attacked military barracks and other locations in the north must not be conflated with our other compatriots – Tuareg, Arab, Songhai, Peul – who live with us,” said Touré in a televised address on Feb. 1. Also seeking to ease ethnic tension, Mali’s Minister for Infrastructure and Transportation, Ahmed Diane Semega, the following day stressed that not all Tuareg are part of the rebellion. “Of the nearly 3,600 Tuareg in the national army, fewer than one hundred have deserted,” he said. According to a military source, 300 Tuareg fighters – the largest contingent of Malian Tuareg soldiers who returned from Libya after the fall of Moammar Gaddhafi – have been deployed with the Malian army in the areas of Kidal, Tessalit and Gao, all in the north. These fighters, drawn from the Imghad Tuareg community, have been placed under the command of Colonel Elhadj Gamou, a Tuareg who joined the Malian army in line with the terms of a 1992 peace pact that ended a previous uprising in the same region. 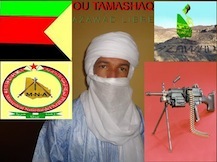 On Dec. 3, 2011, well before the latest uprising, two representatives of this Tuareg community – Colonel Waqqi Ag Ossad and Comander Inackly Ag Back – met with President Traoré and told him their group was ready to give up their weapons and serve the state. According to Bamako-based journalist Cheikna Hamalla Sylla, the presence of the Imghad soldiers is the reason that an attack on the rebels’ main objective, the city of Kidal, has been delayed so far. Notwithstanding continued military operations against the rebels, Touré has stated that the government still plans to hold presidential elections scheduled for Apr. 29. Leaders of Mali’s political parties want a forum on peace and reconciliation to be held from Feb. 17 to 19, and they have called on the Malian authorities to contact the governments of Algeria, Burkina Faso, Mauritania and Niger for assistance in opening a dialogue with the rebel groups. They also want the government to speak to leading Tuareg and Arab figures who have left Mali for neighbouring countries; and to the ambassadors of France, the United States and the European Union for assistance in creating the forum for peace and reconciliation.